I've been on a smoked salmon craze lately. It seems that when I see it on a menu, I am inclined to order it before anything else. So finding ways to use it in recipes at home was the next logical step for me. Scouring the internet I found a Jamie Oliver recipe for smoked salmon butter with leeks. This combination intrigued me so much I knew I had to give it a try. The combination of silky, smoked fish paired with the sweet onion taste of the leeks was fabulous. Add in the salty capers and mild butter to round it out and this is an appetizer I know I will make again and again. Place the butter, smoked salmon and lemon juice in a food processor and blitz until smooth. Season with salt and pepper and set aside. Trim, halve and slice the leeks lengthways. Add the leeks, butter, oil, bay leaves and thyme to a shallow saucepan, place over a medium-low heat and bring to a simmer. Cook for 10 minutes, turning, until leeks are golden. Pour in the wine, cover and cook for 15 minutes or until leeks are tender. You may need to add some water to this. Remove the pan from the heat and rest the leeks in the liquid. Put the capers in a small saucepan and add enough olive oil to cover them by 2cm. Place it over a high heat and fry until the capers begin to open and crisp up. Using a slotted spoon, transfer the capers to a plate lined with a paper towel. Toast bread until golden, about 1 minute each side, and drizzle with olive oil. 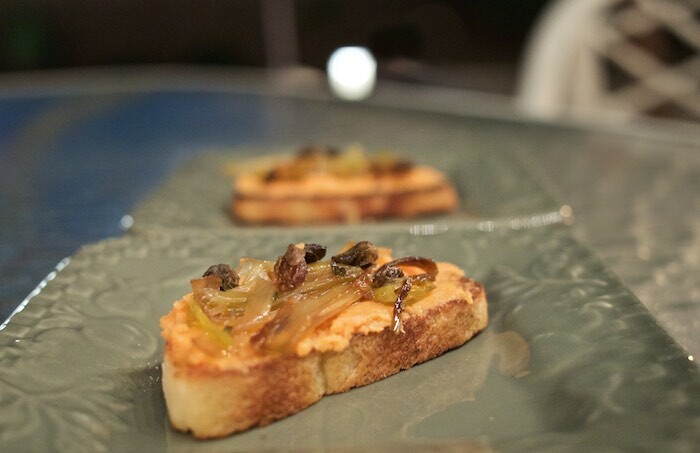 To serve, spread the toasted bread generously with the smoked salmon butter and top with the leeks, and fried capers. Love crostinis. And they are extremely versatile. My father in law loves to make salmon at Thanksgiving (the day before) Its a tradition. I have to share this! This is my kind of crostini! I've always been obsessed with smoked salmon, and this sounds like something I'd LOVE! You know me well. I love, love, love smoked salmon and I could chow down an entire late of this! Perfect appetizer and great combo of flavors here! I could make a meal out of these! Such a wonderful appetizer!! Thank you for sharing! This sounds delicious. Love the addition of the leeks. I love smoked salmon. These look fabulous! Oh my goodness. I am a fiend for smoked salmon, but I've never eaten smoked salmon butter. How can this be so? I'll need to try this recipe for the holidays. Wow this sounds so rich and decadent. Yum! I'm like you. I love anything and everything with smoked salmon. This recipe looks really interesting. Thanks! I've been all about the leeks this fall... such a great mild flavor! And smoked salmon is my fav... so this is the perfect combo! What a great appetizer! Now I wish I had some smoked salmon! Mmm! Smoked salmon butter sounds amazing! Gotta try that! Wow! What a delicious combo! I love smoked salmon too!